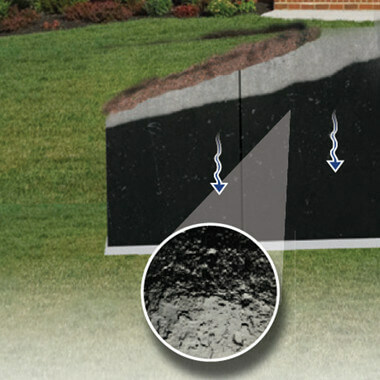 An effective waterproofing membrane is the core of any water protection system. If water never touches a wall, it is less likely to damage a structure. Without a waterproofing membrane, all buildings are susceptible to water damage, cracking, erosion and worse. Mar-flex’s QuickSeal waterproofing membrane was developed to provide an economical level of waterproofing for a wide variety of applications. QuickSeal is both versatile and effective. It can be applied as water-based latex emulsion or a solvent-based solution, and comes with a limited warranty. QuickSeal has been tested and proven in applications over almost all clean, dry and sound substrates. Solvent-based QuickSeal can be applied in air temperatures as low as 0°F. 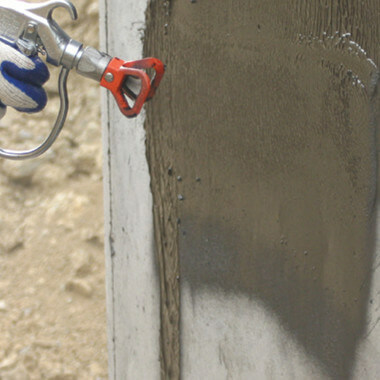 QuickSeal waterproofing membrane is sprayed directly onto walls and is recommended for new construction waterproofing of all below-grade basement walls of poured concrete, unit masonry or *Insulated Concrete Forms (*waterbase formula). As water comes into contact with QuickSeal, it is unable to penetrate the impermeable waterproof membrane. and instead drains safely away. This process works most effectively when used as part of a water protection system, including a drainage board and drainage tiles or other foundation drainage product. Pairing QuickSeal with an approved Mar-flex drainage board can increase the membrane’s residential warranty from 10 years to 30 years. Mar-flex LiteFUSION Waterproofing Membrane is an economical water-based acrylic waterproofing membrane for use when hydrostatic pressure exists.